The evolution of the paintings came about through the weaving together of many thematic threads, synchronicities and the unearthing of accumulated layers of experiences. I am indebted to the caravan of souls whose work has informed, challenged, and inspired me over the course of my lifetime. In 2010 I took an icon painting class. I loved learning about the tradition, but felt constrained by the discipline of copying forms from the past. Several months later I signed up for an interactive painting class being offered on the internet. The images of the Black Madonna illustrating the class subject and style were reminiscent of icons but felt more alive and contemporary. During the previous year I had embarked on a personal study of the Black Madonna and so I felt compelled to take the class taught by Shiloh Sophia McCloud of Cosmic Cowgirls University. The larger context of my life at this time was my involvement with very public environmental activism against natural gas drilling in my community. Painting the contemporary image of Black Madonna Cradles the Earth was deeply healing for me and offered me a way to express my grief and anger in a non-confrontational, nonlinear way. In January 2012 I set the intention to paint a Madonna each month during the upcoming year. 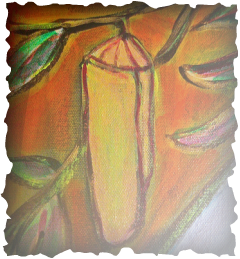 Immediately before I began painting I had a dream in which I saw an image of Our Lady of Guadalupe on an oval canvas. I woke up and knew the paintings had to be done as ovals. At the same time I was reading Mary Within Us: A Jungian Contemplation of Her Titles and Powers by David Richo. Suddenly my decades-old dream of creating contemporary images of Mary had inspiration, a form and an archetypal foundation. As I painted, the poetic titles of Mary in her ancient litanies offered a rich symbology and became the organizing theme for the series. I begin by meditating with titles from the litanies until one in particular feels like it has the most energy for me in that moment. I allow images and symbols to spontaneously surface in response to my meditation, and I make note of these in my sketchbook. Usually a general theme or concept begins to take form. Once I have a very preliminary sketch I begin to do research on how a particular title has been visually interpreted in the past. I broaden my research to find connections between the essence of Mary's title and divine feminine archetypes found in other cultures and historical epochs. Symbols which become incorporated into the paintings are chosen because of their continuity and evolutionary interpretation. There is an intuitive knowing which bypasses analytical thought processes as various elements of the painting are included. Each painting is a visual meditation and the act of painting is embodied prayer. I approach every new painting with a ritual setting of intention. Wearing a designated prayer shawl, I write a prayer directly on the canvas, asking that the images that come through me may be a healing balm for all wounded hearts and for the wounded earth. 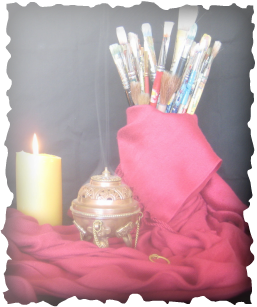 Using a thurifer and frankincense, I incense the canvas, my paints, brushes, hands and chakras, ascending and descending, asking that we be a portal through which the Divine can enter the world. I ask that I surrender personal will and ego in service of the highest universal good for all creation. The canvases are 24" x 36" convex ovals, giving them an intriguing dimensionality. I use Golden fluid acrylic paints because of their translucency and glazing capabilities. After applying a loose spontaneous layer of paint to the white canvas I draw a rough outline of my subject matter. As the painting proceeds there is a mysterious process of engagement and observation during which time the painting takes me where it wants to go. This is the point at which surrender of a planned outcome often happens and the painting takes on a life of its own. There are many times when I do not know how to move forward. Then I sit and wait for the painting to reveal to me what it wants. I find the experience akin to falling in love with a newborn. There is an intuitive knowing when the painting is complete. ©Yvonne M. Lucia 2013. All rights reserved.